orange, brown, purple, yellow, blue, green, pink, red, blue and black and white! Check out my Mother's Day Project where the pots are used! These images have been created for personal, educational, and small home business use. The purchaser is provided a single non-exclusive user license for use of the images. The purchaser may use the images to enhance personal items, educational items or items for commercial use. The digital files created are not to be resold, distributed, gifted, traded or shared. They are for the use of the original purchaser only. These images may not be sold as clip art or “as is” for re-sale. You must add other text and graphics to your product to make them your own. All of your products/freebies must be in a flattened format such as a PDF and securely protected. 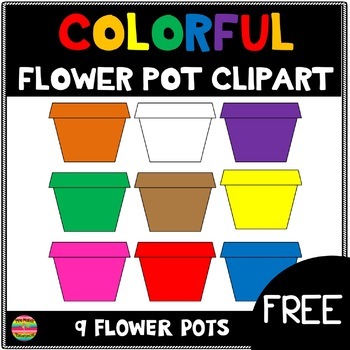 All freebies and products that incorporate my clipart must provide credit to Mrs. Male’s Masterpieces, a link to my TpT store or my logo/button. All of my products are either FREE or 1/2 price for the 1st 24 hours in my store! Follow me to be notified of all of my new products!